Is your house heat-drenched this summer? Are you trying to avoid using that oven because you don't wish to add to the misery? 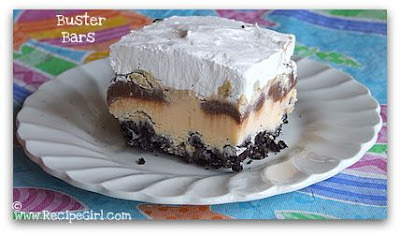 Here's a no-bake frozen dessert that you will have a tough time not eating. Are you familiar with Dairy Queen? These were a popular treat from DQ: Buster Bars. I think they've phased out a lot of the Dairy Queen franchises. There are a couple of DQ's that I know of in San Diego, and I have no idea if they still carry Buster Bars. But now you can make your own!